Very Clean, good running.All brand new cloth up and down including canopy. Done up in camo theme. 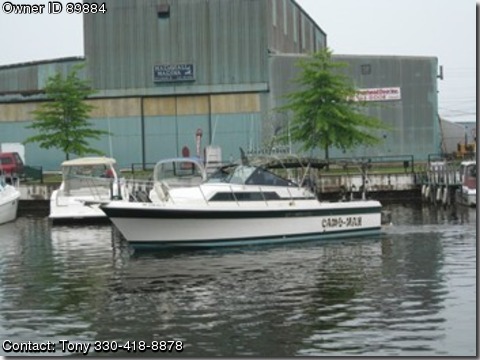 GREAT FISHING BOAT AND STAY OVERS ARE A BREEZE. Boat has a Tohasu 20 hp kicker for trolling, with manual and remote control steering. Saved over $1,000 in fuel bills last season. Will sell complete outboard system for additional $3,000. Twin 454's run good with 750/800 hrs, a piece. Set up for planners, dipsys, down riggers.12' beam. Love the boat, but must sell, possible move in future. NOTE: Willing to consider trade for smaller boat plus funds if anyone is looking to move up to a larger boat.